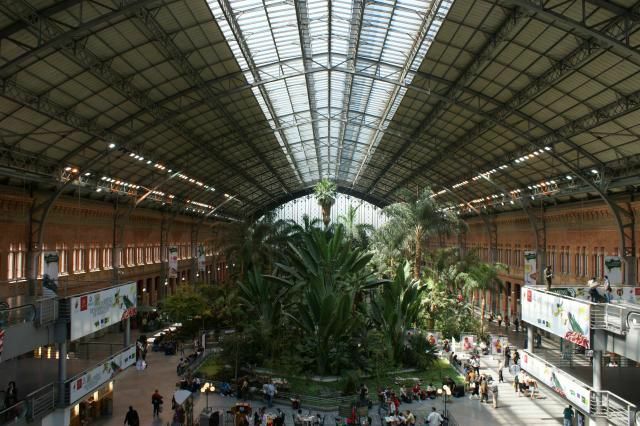 The main train station in Madrid is called Atocha. The nearest metro station is Atocha Renfe. The main bus station is called Estación del Sur and is close to Méndez Alvaro metro station. There is a second train station, Chamartin, in the north of the city. There are several smaller bus stations in Madrid, including Avenida de America, Principe Pio, and Moncloa. To go straight to booking your bus or train tickets, hit up these links. The Spanish rail network is efficient and well connected, at least from Madrid. However, it can occasionally be a bit expensive compared to the bus and it isn't always quicker. Read more about Bus vs Train Travel in Spain. Madrid's two main train stations, Atocha and Chamartín, are linked by the Cercanías local train service. Some routes go right through Madrid and visit both stations. There are two stops on the Cercanías line between Atocha and Chamartín at Nuevos Ministerios (which is also a major Metro interchange) and at Recoletos on Paseo de la Castellana (nearest Metro is Chueca). Which Train Station Do I Need? Below are the most common destinations for traveling from Madrid with the train station you'll need, good for 2014/2015. Read more about Madrid's train and bus stations below this table. Atocha train station, more formally known as Puerta de Atocha. Close to the city center, Atocha has many of the city's most famous sights within a five-minute walk (see below). At the end of c/Atocha and Paseo del Prado, about twenty minutes' walk from Sol. Where Can You Go from Atocha? Atocha serves most routes to the south and east of Spain. See the above table for the most popular routes in Spain. At Atocha train station itself, there is a little tropical garden, complete with terrapins, in the main forecourt (see picture above), as well as the Memorial to Madrid Bombings of 2003. Across the road from Atocha there is the Reina Sofia Art Museum, home to the Guernica, Picasso's most famous work. You can check your luggage here, so even if you're just transferring from the airport to the train station, a quick trip here is a great way to break up all that traveling. There is also El Brillante, where you can get the finest calamari baguette in the whole of Madrid. A few minutes further away is the Prado museum, Spain's most famous classical art museum. The easiest way to get from Atocha station to Chamartin is to take the Cercanias local rail service. Chamartin is three stops from Atocha and the journey takes just 10 minutes. The cost of a ticket is about 1.50 euros. If you have some time to kill between trains, you may want to explore the city center first. In which case, you'll want to take to take the metro instead. If you're arriving in Madrid at the main airport (Barajas), you have a few options for getting to Atocha. Taxi The Madrid government recently fixed prices for taxis from Madrid airport. Now a taxi from Madrid airport to Atocha (or anywhere else in the city) will cost 30€ any time of day, including baggage. Bus and Walk There is a bus every twenty minutes or so to Banco de España in central Madrid. From here, it is an easy 20-minute walk to Atocha, straight down the Paseo del Prado. The bus costs 5 euros. Metro/Cercanias Take the metro one stop to Airport Terminal 4 and then take the Cercanias (local train service) to Atocha. These two train services require two different tickets. It is around the same price as the bus, and as the walk in the airport to the metro is quite long, it may be no quicker than the above bus-and-walk option. Alternatively, take the metro to Nuevos Ministerios and change to the Cercanias there. Sol is the central point in Spain (in fact, it's the center of the whole of Spain). Walk You can walk from Sol to Atocha in around 20 minutes. Walk down Calle Carretas, cross Plaza Benavente and turn left down Calle Atocha. Metro/Cercanias Take either line 1 of the metro or the Cercanias to Atocha. It takes around five minutes. Madrid's main bus station, technically called Estacion Sur is located quite close to Atocha train station, but you are most likely to want to take the train to get between the two. Metro/Cercanias Atocha is one stop from the bus station by Cercanias. Travel by metro is also possible, but it requires a change. Walk It takes around 25 minutes to walk between the two stations, all along one street - Calle Mendez Alvaro. Where is it? : In the north of Madrid, a few minutes walk north of Paseo de la Castellana. It is on Line 10 of the Metro. Chamartín is 6km from the airport. C/ Agustín de Foxa, s/n. tel: +34 902 24 02 02. For Travel to: International services and trains to: Bilbao, Salamanca, Avila, Santiago de Compostela, A Coruña, Valladolid, Burgos. Spain has an extensive bus service run by a number of companies from various bus terminals, which makes booking your ticket quite difficult. Tickets can be booked from the stations, but it is often easier to use the Movelia online reservation service. Madrid's main bus station is Méndez Alvaro. Avenida de America is also important for some northern routes. There are a couple of other bus stations but these are mainly for local routes. Where is it? Méndez Alvaro is in the south of the city, a short metro ride from Atocha train station (however, it is not a direct route and if you have lots of bags it might be preferable to take a taxi). The station is also referred to as 'Estacion del Sur' (South Station). For Travel to: This is Madrid's main bus station - if it isn't covered elsewhere on this page, chances are this is the bus station you want. Mainly for buses to the south, east and north-west. Where is it? In the north-east of the city. It has its own Metro station which is very well connected. The bus from the airport comes straight here. For Travel to: North and north-east destinations such as Barcelona, Bilbao, San Sebastian, Santander, Vitoria, Burgos. Buses to the north-west usually depart from Méndez Alvaro. The main Conde de Casal Bus Station, which ran the Auto Res bus company's national routes, closed on September 18 2007. All Auto Res buses that used to leave from Conde de Casal now leave from Estación del Sur on Mendez Alvaro (see above). However, the 'inter-urban' routes (to the suburbs and small towns outside of Madrid) still run from Avenida del Mediterraneo, near Conde de Casal. This includes buses to Chinchon. Where is it? To the south-west of the city - the Metro offers a shuttle service from Opera to Principe Pio. Opera is 5 minute walk from Sol. The bus station isn't in the metro station itself but just outside it, on Paseo de Florida. For Travel to: Mainly local services and Segovia. Where is it? In the west of the city, a 10-minute walk from Plaza de España. For Travel to: Mainly local services and El Escorial. Where is it? In the north of the city, not far from Chamartin train station. For Travel to: Mainly local services, including Manzanares El Real and Buitrago.